Earth from Space: Lake Huron. The Copernicus Sentinel-2A satellite takes us over Lake Huron, the second largest of the five Great Lakes of North America. Bound on the north and east by the Canadian province of Ontario and on the south and west by the state of Michigan in the U.S., Lake Huron was the first of the Great Lakes to be seen by Europeans in 1615. This image highlights the dominance of agricultural production in the region where conditions are ideal for cultivating corn, soybeans and hay. 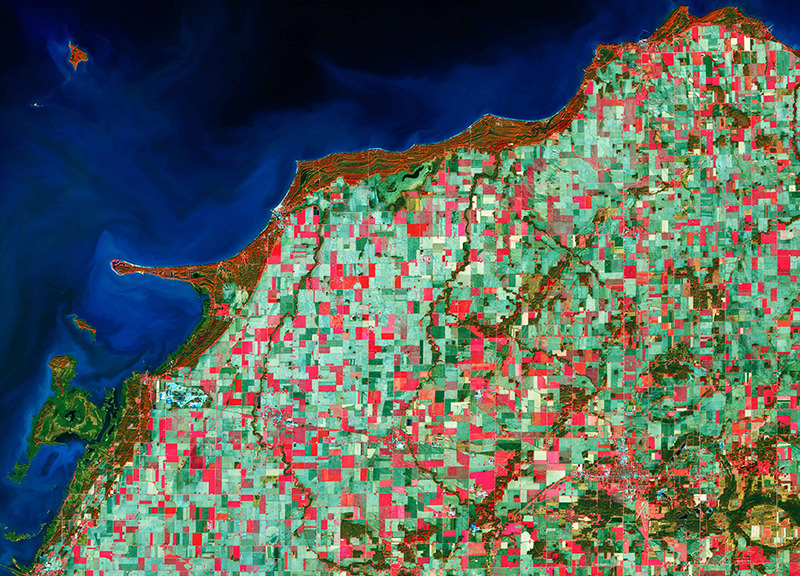 The coloured blocks in the image show a grid-like structure for growing crops, typical of American agricultural practice. This image also shows signs of sediments and algae bloom along the coast, one of the consequences of intensive agricultural activity in a region that responds to the ongoing demand for produce. Lake Huron is around 330 km long from northwest to southeast. Covering an area of over 244 000 sq km and containing around 22 600 cubic km of water, together the Great Lakes form the largest connected area of fresh, surface water on Earth. The only places that hold more fresh water are the polar ice caps. Many islands lie in the northeastern part of the lake, with Heisterman Island, North Island and Middle Grounds Island, home to Wild Fowl Bay State Park, shown on the bottom left of the image. This image, which was captured on 1 December 2017, is also featured on the Earth from Space video programme.